Bella Tucker, from New Hampshire, won cheers and a standing ovation after gaining the courage to perform Somewhere Over the Rainbow to a room of 200 people at a talent show. The inspirational teenager learned the instrument after contracting a deadly virus which her parents originally thought was the flu at the age of eight. Her dad Rich Tucker, 48, said the deadly virus, caused by Streptococcus pneumonia bacteria, turned her entire body purple after it infected her bloodstream and left Bella on the brink of death. But miraculously she pulled through but had to have all four limbs amputated to save her life. After eight months in the hospital and intensive physio, she took up piano lessons and now she practices whenever she can and has mastered the skill of performing beautiful songs by pressing keys with the stumps of her arms. 'I use the tip of my arms to press the keys and I simplify the music so I play no more than two notes at a time,' Bella said. Bella's ordeal began on Easter Sunday 2010 when she woke up feeling achey, tired and suffering from flu-like symptoms. 'She said she would take it easy and ride it out a but then I noticed her stomach was starting to turn dark purple so we rushed her to ER,' Rich said. Doctors had told Rich that there was a chance Bella wouldn't make it but the little girl defied the odds to pull through after medics exchanged the infected plasma for healthy plasma. Slowly the purple disappeared from her face and stomach but as that was clearing up, her limbs became darker and darker until they were completely black. Doctors had no choice but to amputate both her legs above the knee and arms above the elbow to save her core. 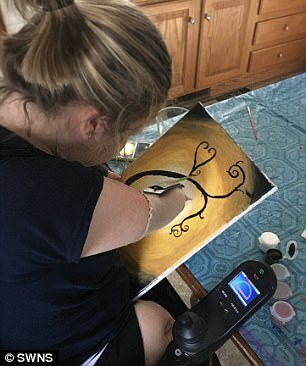 Ever since then, determined Bella has battled to do things that other kids can do - such as painting using a cloth sleeve on her arm and playing piano. 'It was the scariest time of my life but Bella's attitude throughout has just been absolutely unbelievable,' Rich said. 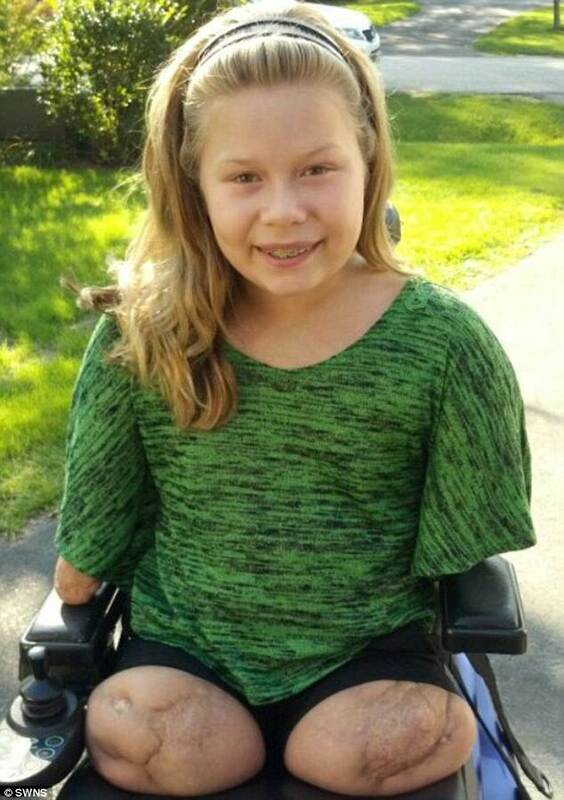 Bella made her on-stage debut in front of hundreds of other children and their parents in August at a talent show at Camp No Limits in Maine. It was an event hosted by the No Limits Foundation, a non-profit supporting children with limb loss. Mary Leighton, founder of the No Limits Foundation, said that Bella had the room in silence while she played and brought everyone to tears of joy. 'She was really shy before and so the fact she would even get up and play in front of 200 people just blew me away,' Rich said.